[i carry your heart with me(i carry it in] is probably the first E.E. Cummings poem I ever came across. I fell in love with it then. It’s so beautiful and effortless, simple and deep. I think it’s one of the most romantic of all poems and superlative in it’s embodiment and encapsulation of love’s transcendent power. It’s always been one of my favorites. I had a hard time not including it in my Poetry Month Celebration blog post, last year, but I’d limited myself to only choosing one of my favorite poems from each of my favorite poets, so I went with [love is more thicker than forget]. I figured it was a lesser known poem. Then, in May, I came across this video. It’s one of the best analyses of a poem, I’ve ever come across. It may seem a little long, but it’s well worth the time. It starts off with a recording of Cummings, himself, reading the poem and then goes on to analyse the poem and how it relates to Cummings and his poetry in a broader sense. It’s fascinating, especially the part where it shows how brilliantly Cummings used parentheses to overlap and add another level of depth to the poem and, also, where it touches on Cummings’ views on love and truth and how they can only be “known” by being experienced. I think Cummings certainly found a way to allow the reader to experience the beauty of “truth and poetry and love” through this poem. Because it’s always lovely to get a good poem recommendation. What are some poems you like? I’ll keep this to one poem per poet, even though it’s difficult when it comes to E. E. Cummings, and especially difficult when it comes to T. S. Eliot and Gerard Manley Hopkins. These are some favorites that immediately come to mind. What are some poems you dislike? I don’t usually finish poems that don’t interest me. If I do, I tend to immediately forget them, so it’s a bit difficult to name names. However, (and this may make me seem like a philistine) there is one poem I’m not very keen on: Robert Frost’s “The Road Not Taken“. My problem isn’t really with the poem itself, but more with it being ‘the [poem] not taken’ in context by so many people. As I’ve said in another post, it bothers me when things get taken out of context and given a meaning that is not even close to (or the opposite of) what the author was actually saying. The popularity of Robert Frost’s “The Road Not Taken” seems to lie in the fact that most people only, or mainly, remember the last three lines and forget the last two lines of the second stanza, as well as the first two lines of the last stanza. Are there any poets whose work you especially enjoy? If so, who are they? T. S. Eliot and Gerard Manley Hopkins. E. E. Cummings interests me greatly, but I can’t really say I’ve read enough of his poetry to put him in that “special” category. 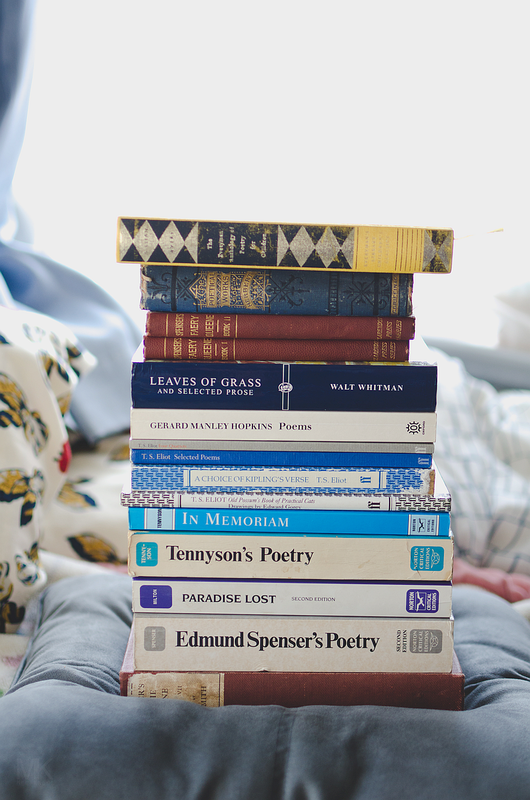 Have you ever memorized a poem? Yes. Most recently, T. S. Eliot’s “The Love Song of J. Alfred Prufrock”. Last year, in September, I started memorizing T. S. Eliot’s “The Hollow Men”, but got busy and forgot about it…this is a good reminder. A good poem is something that says ‘just what I mean’; it’s an expression of emotions and truth in a way that you never knew you’ve always wanted to say; it’s about using words to paint a magnificent scene (be it glorious or tragic) that everyone knows, but no one has quite seen before. A good poem happens when raw, honest, beautiful, terrible feelings and thoughts find the right words to embody them. As a result, a good poem makes you think. A good poem makes you feel something. Do you have any favorite poets or poems? Any poems or poets you especially dislike? If so, I’d love to hear about them. Reading Kierkegaard’s Fear and Trembling #3–Finished! Reading Kierkegaard’s Fear and Trembling #2–the Underground Man, Prufrock and Other Thoughts.